GNAEUS DOMITIUS CORBULO was a Roman general who preserved Roman supremacy in Germania and in the East. He was the son of the famous Praetor, master of the Roman roads during the reigns of Tiberius and Gaius Caligula. Corbulo achieved some success as a military officer quite early in his career. In 47 AD, he received the rank of legate for Germania Inferior and took command of Roman troops in the face of the invading Chauci. Corbulo won a series of battles against Germans, including a battle of the Rhine. Corbulo also shattered the strength of the surrounding tribes, especially that of the Frisii. Corbulo was known as being a strict and stern general. He is largely credited for bringing the legionaries back to full strength and raising their morale. He came to regret his lack of free movement as a general under Claudius. Germania, in his view, was ripe for subjugation. 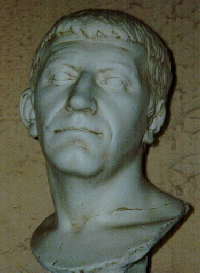 However, Claudius forbade any actions in that direction, and Corbulo was said to have remarked: “How happy must have been the generals in older days!” His position as such was not that dissimilar to General George Patton of World War II who saw Russia as the real threat and also wanted to preempt history. Corbulo’s reputation was enhanced by his reception of the triumphal insignia from Claudius. When Nero, there fore, searched for an officer to salvage Roman policy in Armenia, in 54 AD, he turned to Corbulo.